Fall in puppy love or find a purrrrfect cat for FREE or at a discount through Sunday! 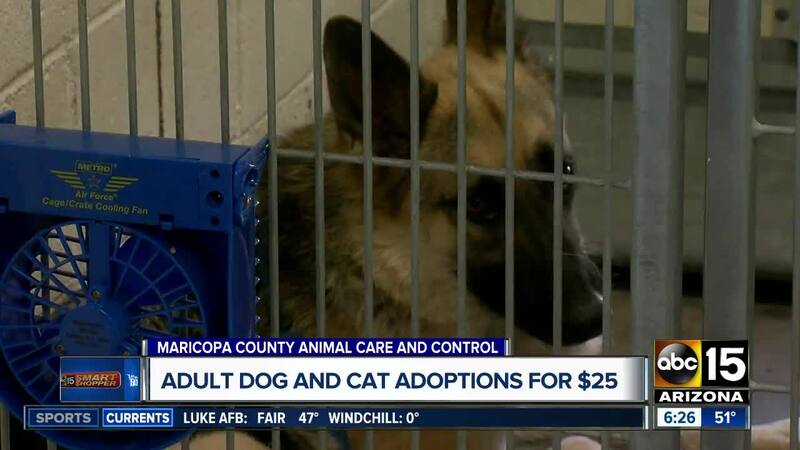 Adopt adult cats and dogs this weekend for $25! Saturday, March 23, is National Puppy Day, and to celebrate, this weekend is going to the dogs! The grown-up dogs should get puppy love too! So, the Arizona Animal Welfare League is offering FREE adoptions for dogs through Sunday. Even though the holiday is for dogs, the discount applies to cats as well. On Friday, all adoptions are being sponsored by Chapman Ford. On Saturday and Sunday, all adoptions are being covered by the Petco Foundation. At Maricopa County Animal Care and Control, they're referring to this weekend as "Mutt Madness." Through Sunday, dogs that are 30 pounds or more are $25, and adult cats, ages seven months or older, will be $25 as well. Normal adoptions range in price between $100 to sometimes over $300. The goal is to clear up the outside kennel space heading into warmer months. Both shelter locations in Phoenix and Mesa are honoring the deal! Click here to find ways to save on treats for your pets, and learn more about the secret menu items at restaurants for dogs! We hope you have a fantastic, and fur-filled weekend!